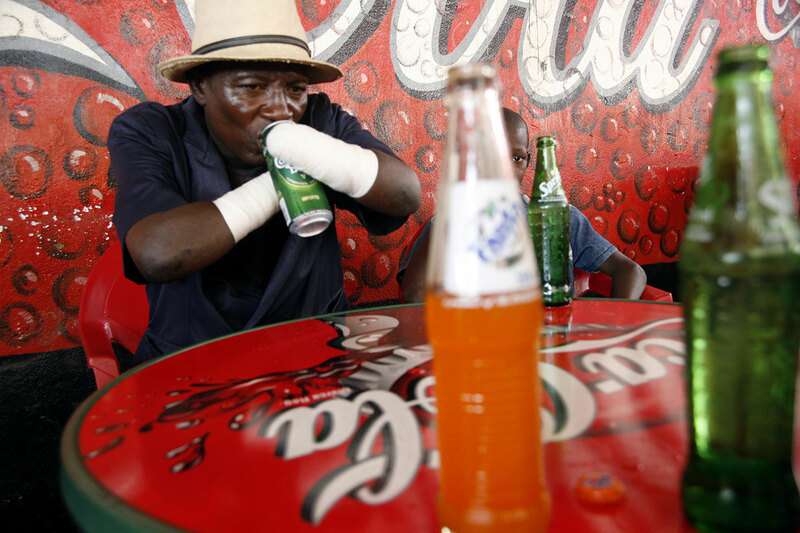 Ngaujah takes a break at a local restaurant, where he often rests during the day to escape from the heat on the streets. Usually he does not eat or drink during the day, saving the money he receives for his family. The only reason he is having a drink on this day is because a visitor bought it for him. • What elements of this photograph stand out to you? • Do you think the photographer chose the background deliberately? What does it mean to take a picture of Tamba in front of advertisements for Coca Cola, a product marketed with such slogans as “It’s the real thing” and “Things go better with Coke”? • What does this image suggest about the aftermath of violence in Tamba Ngaujah’s life? • What might the photographer be suggesting about the aftermath of violence in Sierra Leone?